Easy Display Manager is a simple Samsung tool which allows you to control the function keys and display settings on laptops by Samsung. The layout of the program is pretty basic, consisting of some settings for adjust display properties such as resolution, backlit, rotation and brightness level. 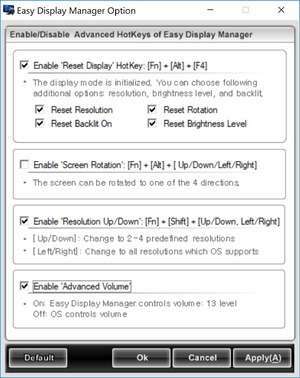 You can use Easy Display Manager for enabling screen rotation, resolution up and down (via FN Alt Arrow keys) and an "Advanced Volume" feature. Apart from basic functionality of assigning actions to FN keys, Easy Display Manager doesn't do much else, though it is useful if you own a Samsung laptop. Version 3.2.5.5 is a freeware program which does not have restrictions and it's free so it doesn't cost anything. For security reasons, you should also check out the Easy Display Manager download at LO4D.com which includes virus and malware tests. Additional screenshots of this application download may be available, too.